Journalist Wesley Morris moderates a Special Tribeca Talks: Tribeca/ESPN Sports Film Festival Conversations: Shooting and Scoring during the 2014 Tribeca Film Festival at the SVA Theater April 25, 2014, in New York City. 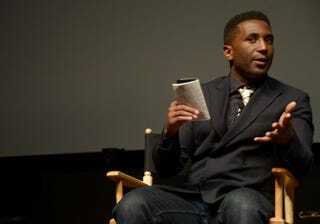 Wesley Morris, a black journalist who won the Pulitzer Prize for criticism in 2012 while at the Boston Globe, is joining the New York Times as a critic at large, the Times announced on Thursday. The Culture section of the Times came under fire last year over television critic Alessandra Stanley's use of the term "angry black woman" to describe television series creator Shonda Rhimes. Executive Editor Dean Baquet said then that he would "love to diversify" the Times' contingent of 20 cultural critics, which included no African Americans and only two of color. He pledged that despite a financial crunch that resulted in layoffs, "I have an obligation to diversify the staff and I will figure out a way." Morris, 39, will be a critic at large in Culture and a contributing writer for the New York Times Magazine, according to a memo Thursday from Danielle Mattoon, culture editor. "I said yes to the job because it was a chance to do writing at the paper that had never officially been done before," that of a critic at large, Morris messaged Journal-isms on Friday. "That will be exciting, I think. And people have been really kind about the news." Morris will be the first African American film critic at the Times since Elvis Mitchell quit in 2004 after A.O. Scott was promoted to lead film critic. The three critics at the time had been equal. "Wesley comes to The Times from Grantland, where he has been a contributor since 2011 and a staff writer since January 2013, writing about film, fashion and music, and co-hosting the pop-culture podcast 'Do You Like Prince Movies?,' " according to Mattoon's memo. "Before Grantland, Wesley spent 10 years at The Boston Globe, where he won the 2012 Pulitzer Prize for Criticism for a body of work 'distinguished by pinpoint prose and an easy traverse between the art house and the big-screen box office,' according to the citation. "As a critic at large in Culture, Wesley will occupy a newly created position allowing him to write essays and criticism across multiple disciplines and to respond to cultural moments as they unfold. He'll be joining a first-class roster of critics, many of whom have been friends and admirers for years. "As a contributing writer at the Magazine, Wesley will cover a range of subjects and bring his critical sensibility and ambitious thinking to bear in a variety of narrative forms, from essays to profiles. He will also be a part of the Magazine's ongoing editorial brainstorm and an integral member of its growing roster of writers with sharp, distinctive voices. "One final word from Tony Scott: 'He's like Oscar Wilde — breathtakingly funny and absolutely serious in the same breath, able to illuminate the deepest and sometimes darkest meanings of a piece of popular culture without losing sight of the fact that it's all supposed to be fun.' "
Morris' hiring will also add diversity to the Times magazine. In April, after the Times hired Nikole Hannah-Jones, who won plaudits for her investigative work on racial issues at ProPublica, as a staff writer for the magazine, magazine Editor-in-Chief Jake Silverstein told Journal-isms, "Building a diverse staff of editors and writers is very important to me and to the magazine, and since I took over in May we have been trying to draw a greater variety of voices to our pages." Hannah-Jones produced a well-received story for last week's Education issue of the magazine, "A Prescription for More Black Doctors: How does tiny Xavier University in New Orleans manage to send more African-American students to medical school than any other college in the country?" Black journalists Jim Harney and Theo Caviness were among several newsroom staffers laid off Wednesday at the Daily News in New York. The cutbacks also forced out sports columnist Mike Lupica, longtime national baseball columnist Bill Madden and Teri Thompson, assistant managing editor for sports. Harney, 63, was one of a half dozen deputy metro editors. He spent most of his Daily News career supervising or helping to manage coverage of the city's boroughs. In the late 1970s, he followed a favorite editor, Bob Herbert, from the Star-Ledger in Newark to the Daily News. Harney told Journal-isms by telephone that "at this point I would like to find a position as a spokesman for a government agency or an elected official," though he would not foreclose any options. Caviness, 39, was design director. He messaged, "I'm not sure what is next. I need a few days to process and plan." Last year, the departures of Michael Feeney, Enid Alvarez, Simone Weichselbaum and Jennifer H. Cunningham left the newspaper with an alarmingly low number of African Americans and Hispanics covering the majority-minority city, though in July, the News hiredLeonard Greene, a black journalist from the New York Post, to work on the rewrite desk. Feeney, who is president of the New York Association of Black Journalists, messaged his reaction to the latest layoffs. "I'm really disappointed that the New York Daily News continues find ways to decrease the number of black journalists that work for the paper, especially in a city where blacks make up a quarter of the population," he said. "From the death of Eric Garner to the killing of 12-year-old Tamir Rice, it is important, now more than ever, that our newsrooms reflect the diversity of our communities. They have to do better." Harney said he was told that the paper is looking to "reorganize its coverage" and that his job would be eliminated. He said he understood that to mean that the News would lean more heavily into digital efforts. "People across the paper's newsroom were fired," Richard Sandomir reported for the New York Times. "Mortimer B. Zuckerman, owner of The News, ended his efforts to sell the newspaper last month; it is said to be losing $20 million a year. The paper's editor in chief, Colin Myler, resigned last week to return to London. . ."
Robert F. Moore, managing editor for news and Metro editor, told Journal-isms by telephone, "I'm not answering any questions." "A flurry of emails came from members leading up to the meeting expressing displeasure with how the changes were communicated by the national office. "NAHJ President Mekahlo Medina said the changes to bylaws are an opportunity to streamline the organization’s structure by updating NAHJ's approximately 12,000-word document of bylaws. It also extends full voting rights to non-media, academic, public relations and student members. "Also during the meeting, Medina said NAHJ needs to tap into new markets to recruit members and increase revenue, while still respecting the organization’s mission. He especially emphasized the need for Spanish-language training. "Earlier in the meeting, tensions boiled over NAHJ's approach to recruiting what Medina estimated as 10,000 Spanish-language journalists nationwide. Fewer than 6 percent of NAHJ national convention attendees work in Spanish-language media, Medina said. . . ."
As reported Wednesday, Medina said in a letter posted on the NAHJ website, "A common criticism our board has heard over the last few years was how journalists who were part-time bloggers, freelancers, semi-retired, academics, media professionals, students or digital developers did not feel equal in our organization. "Some might have a vote, some did not. "The revision to our bylaws eliminates classes. It eliminates tiers. It creates fairness and equality for members who all are working for [the] same goal — more Latinos in newsrooms. "It means everyone who is a member can vote! NAHJ members were to vote on the measures starting Friday. The board meeting was being held in advance of the national conference, which takes place Friday through Sunday in Orlando as part of the Excellence in Journalism convention, which includes the Radio Television Digital News Association and the Society of Professional Journalists. "No Shortage of Africans Among the Migrants"
Robert Samuels of the Washington Post returned from Hungary Wednesday night, possibly the only African American print journalist covering the European refugee crisis. Samuels is a national political reporter who focuses on the intersection of politics, policy and people. He previously covered social issues in the District of Columbia. Samuels' stories from Hungary began appearing on Friday. NBC's Lester Holt anchored Monday's "NBC Nightly News" from Hungary, but he returned to the States on Tuesday. "If there was another [black] journalist on the ground, I did not see them," Samuels messaged Journal-isms on Thursday. "And there are no shortage of Africans among the migrants. Many came from Somalia, where they walked for months to get to the Serbia-Hungary border. In fact we did a story about one couple from Somalia. A few others fled from Nigeria, which does not make as much sense intuitively, but there is an ISIS presence there and also, Nigerians tend to be fairly industrious when it comes to migration." Kristen Hare, Poynter Institute: Migrant or refugee? AP says often "the most effective word is simply 'people' "
"There's a reason why you won't see an Asian American on the main tier of CNN's GOP debate. Or any presidential debate in the near or distant future," Emil Guillermo wrote Wednesday for the Asian American Legal Defense and Education Fund. How About Statues of Trump at the Border? "Even with Donald Trump lowering the bar for presidential behavior, it's not low enough to put Asian Americans on a candidates list. . . ."
Guillermo also wrote, "It's 2015, and Asian Americans are still limited by the take-out box people automatically put us in. "As far as the debates go, I don't like Bobby Jindal because of his politics, but the way he's being treated makes me feel sorry for the guy. I'm sure others don't like him because they simply don't see him as president. "You mean like the guys on Mt. Rushmore — all white? Like Trump? "In fact, here's an idea. South Dakota — home of Mt. Rushmore — is nearly 90 percent white. It's just 1.2 percent Asian. And 3.4 percent Latino. That's almost SIX TIMES lower than the national average for Latinos (17.1 percent). "So you want to cut down that minority immigration? Try the Rushmore effect. Maybe instead of a wall at the border, conservatives should just erect the stone faces of white guys like Trump at the border. That would really keep people away. It's worked wonders in South Dakota. . . ."
"The Undefeated" Takes On Chicago's "Struggle for Hope"
The Undefeated, an ambitious ESPN website conceived by sportswriter Jason Whitlock to discuss the intersection of race and sports, is proceeding without Whitlock, a development outlined by Winston Ross on Sunday for Newsweek. On Wednesday, the site published "Chicago and the struggle for hope" by Jerry Bembry, the story of the murder of Demario Bailey, a twin, at 16. His brother, Demacio, survives. "Demario was murder victim No. 399 last year in Chicago, a city in which 435 people were killed in 2014," Bembry wrote. "That was the most murders in any city in the country. Even as many cities experience dramatic increases in murders in 2015 (murders in Milwaukee are up more than 70 percent from 2014, for example), Chicago, with 341 through Sept. 8, is poised to lead the nation in murders for a fourth straight year. Recently, the city experienced its deadliest day in more than a decade: Nine people in Chicago were shot dead Sept. 2. "But the raw numbers don't tell the story of the Second City and its second city. The numbers don't speak of the violence in Chicago being concentrated in specific neighborhoods and leaving residents living in fear. The numbers don't reveal the tens of thousands of young people in Chicago — good kids such as Demacio — who live lives of forced imprisonment, with their parents trying to shield them from the gang activity and violence that overwhelm some neighborhoods. . . ."
"Take a zero-tolerance mindset, mix it with a bit of Islamophobia and you get what happened to Ahmed Mohamed, an inquisitive 14-year-old model student at MacArthur High School this week," Jim Mitchell wrote Wednesday for the Dallas Morning News. "The attacks of Sept. 11, 2001 and the Columbine massacre in 1999 were seminal events in how this country now reacts to perceived threats. Irrational fears often supplant common sense, as Ahmed's' treatment shows. "Personally, I think Islamophobia fwas a key part of Ahmed's treatment, and I dare say that Irving Mayor's Beth Van Duyne anti-Islamic comments this past spring helped poison the water. Still, the handcuffing and detaining of Ahmed for proudly bringing a homemade clock to school is yet another example of a school administration that has taken zero-tolerance mindsets to absurd lengths. . . ."
The incident was also the subject of an Dallas Morning News editorial, "Overreaction in clock-bomb mix-up has chilling effect," and column by the Morning News' James Ragland, "News flash: Irving officials owe young Ahmed Mohamed a big apology." "The Committee to Protect Journalists will honor journalists from Ethiopia, Malaysia, Paraguay, and Syria with the 2015 International Press Freedom Awards," the committee announced on Tuesday. "The journalists have endured death threats, physical attacks, legal action, imprisonment, or exile in the course of their work. "Raqqa is Being Slaughtered Silently, a Syrian citizen journalist collective and one of the few independent news sources that continues to report from inside the Islamic State's self-proclaimed capital. . . ."
A column Sunday in the Pittsburgh Post-Gazette that included the line, "Slavery was horrible, but no black American living today has suffered from it. Most are better off than if their ancestors had remained in Africa," was condemned Monday by the Pittsburgh Black Media Federation and online by Rochelle Riley of the Detroit Free Press. But the Post-Gazette has seen little reaction. "Not a torrent," Tom Waseleski, editorial page editor, emailed Journal-isms. "Beyond the two letters [here and here] we printed today, we've gotten a handful more, all of which criticize the column. We'll print more of the responses as they come in. Took some phone calls and emails from readers yesterday, too. Again, a handful, which is not out of the ordinary for our audience." "You read it here first: Irika Sargent, a Miami news anchor and Cornell-educated lawyer, has been hired to replace Kate Sullivan [accessible via search engine] alongside Rob Johnson on the Monday-through-Friday anchor desk at CBS-owned WBBM-Channel 2," Robert Feder reported Tuesday for his Chicago television-news blog. "Sargent, 35, most recently has been 5 and 11 p.m. anchor at CBS-owned WFOR-TV in Miami. Starting October 19, she'll co-anchor the 5, 6 and 10 p.m. newscasts here with Johnson. . . ."
"Americans commonly — and mistakenly — believe that well-to-do black people no longer face the kind of discrimination that prevents them from living anywhere they can afford," the New York Times editorialized on Tuesday. "But a federal housing discrimination complaint filed last week by the National Fair Housing Alliance shows that this toxic problem is very much with us, nearly 50 years after Congress outlawed housing discrimination in the Fair Housing Act. . . . "
"Florida A&M University officials have launched an 'official' news site over objections from students and alumni," Tylisa Johnson reported Tuesday foralldigitocracy.org. "Outcry had delayed the launch by a week after university president, Elmira Mangum, proudly announced late last month that her administration would launch an official university newspaper. 'It won’t be The Famuan. It'll be a real newspaper, like the Wall Street Journal,' Mangum said at the time. . . ."
"It was a Friday night like any other," Monica Herndon wrote Wednesday for the Tampa Bay Times in Florida. "I was working the night shift, covering high school football, as I had for the last few weeks. I was starting to like the routine of it, following the action and sending pictures back to the newsroom at halftime. Third quarter, I'm photographing a linebacker sprinting down the field, thinking to myself, 'This is great, way better than the other pictures I have of this kid.' Next thing I remember I'm in the back of an ambulance, and paramedics are asking me questions I can't answer. . . . It's nearly two weeks later and I still don't remember how I got hit" and suffered a concussion. . . .
"Last fall, while reporting for UC Berkeley Graduate School of Journalism's hyperlocal news sites Oakland North and Richmond Confidential, a handful of first-year student leaders recognized a need for guidance in covering communities that were new to them," the university reported on Aug. 27. "Two of them, Gabriela Arvizu ('16) and Zainab Khan ('16), applied for and received a grant that will allow the school to address this need. As a result of their initiative, the J-School will now offer in-depth training on equity and inclusion. . . ."
"A Lubbock TV reporter is accused of leaving a pedestrian seriously injured in a hit-and-run crash involving a station-owned vehicle Thursday evening in South Lubbock," Adam D. Young reported Friday for the Lubbock (Texas) Avalanche-Journal. "Patricia Janelle Cun Villacin, 23, was released from the Lubbock County Detention Center on Friday afternoon on $5,000 bond after police say a witness saw a KCBD-TV SUV hit a pedestrian about 6:30 p.m. Thursday . . ."
"Vicente Arenas is no longer with CBS News," Brian Flood reported Monday for TVNewser. "Arenas joined CBS News last March as a Miami-based correspondent from KHOU, the CBS affiliate in Houston, where he had been a weekend anchor and reporter since 2003. . . ." Arenas has been president of the San Antonio Association of Hispanic Journalists and the Houston Association of Hispanic Media Professionals. Esther J. Cepeda of the Washington Post Writers Group and cartoonist Lalo Acaraz, participants in last weekend's Regional Media Summit in Detroit staged by Unity: Journalists for Diversity, have written about the experience. Alcaraz titled his posting, "My Big Fat Mexican Detroit Weekend." Cepeda's was called "The real story of Detroit." Alan Stamm of Deadline Detroit commented on this column. Reporter Jonathan Wilson has been named to the afternoon host position at WAMU-FM, the NPR News affiliate in Washington, succeeding Elliott Francis, whose contract was not renewed. Wilson, who is half Filipino and half African American, is a member of the National Association of Black Journalists and the Asian American Journalists Association. He has cautioned that more younger people are accustomed to multiracial people and do not necessarily subscribe to traditional racial categorization. The International Press Institute said Friday it "denounced the Ecuadorean government's intention to forcibly close Fundamedios, a civil society organisation that has dedicated itself to monitoring attacks on freedom of expression in the Latin American country for more than eight years. . . ."